Boom Boom! – the clay bird flies – can you shoot it down? It’s harder than you think! Try to knock the clay bird out of the sky with the purpose-built under/over double-barreled shotgun. Clay birds are fired automatically from the machine, and you have two shots to try to hit each one. 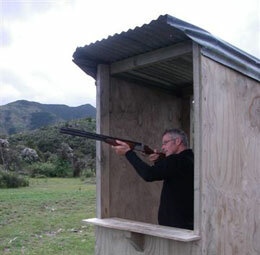 Set within the beautiful scenery around Hanmer Springs, our shooting range is the ideal spot for you to test your eye-hand co-ordination. You’ll be given full instruction on how to use your gun. Get a bunch of friends together and stage a competition. Who will be the winner in a clay bird “shootout”?